Incorporated on January 21, 1846, the Town of Polk hosts numerous lakes, streams, and rivers. Located in the center of Washington County, the Town’s northern edge follows the coastline of both the Little and Big Cedar Lakes. Major rivers within the Town include Coney River, part of Evergreen Creek, and Cedar Creek. From the earliest days of white settlement, Cedar Creek’s potential as a source of water and power attracted newcomers. Dinsmore Maxon, a surveyor by trade and native of New York State, was the first to settle on Cedar Creek. In the mid-1840s, Maxon built the first sawmill on the waterway. He went on to serve several terms as a state Senator and help establish Wisconsin’s government in 1848. Local accounts of this early settlement suggest that Maxon and Chief Kewaskum of the Potawatomi lived as amicable neighbors. 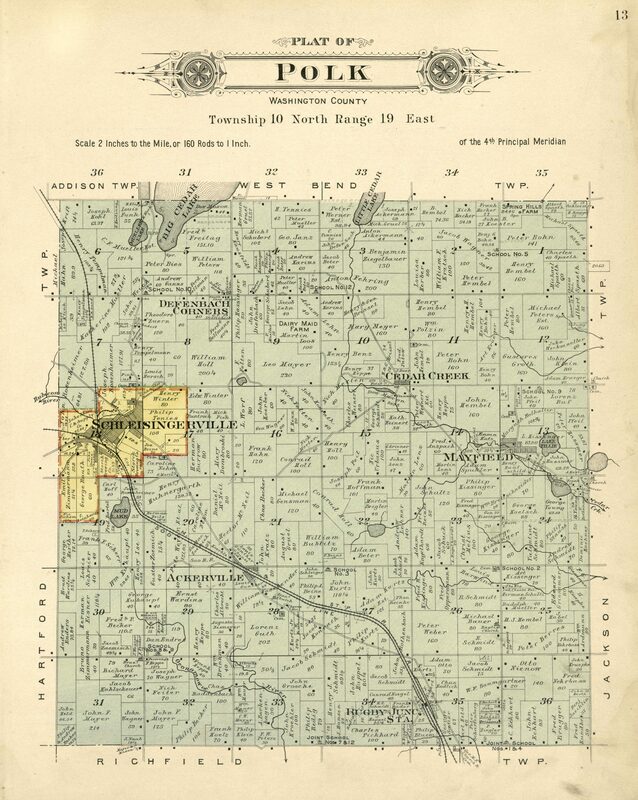 In 1845, settler Baruch Schleisinger Weil purchased nearly two thousand acres, a vast swath of land in the northwest part of the Town of Polk. Schleisinger Weil’s land made up Schleisingerville, officially incorporated in 1869. In 1921, Schleisingerville was renamed the VILLAGE OF SLINGER. Since the initial survey that outlined its borders, the Town of Polk has also given up land to the VILLAGE OF RICHFIELD (upon its 2008 incorporation), the Village of Slinger, and the VILLAGE OF JACKSON. Unincorporated hamlets located within the town limits in the present day include Mayfield, Cedar Creek, and Ackerville. In 1855, the LaCrosse railroad passed through the Town, making a stop in Ackerville on its way to a larger depot in Schleisingerville. From 1853 until 1912, the Town was home to Washington County’s 160-acre Poor Farm. The Poor Farm, which functioned as an actively-cultivated tract of land, supported about twenty residents at any given time during its tenure. The recorded population of the Town of Polk in 1860 was 2,457. The town experienced a loss of population from that point until the 1930 census, in part due to the incorporation of Schleisingerville. But 1960 saw a sharp percentage increase, with the population growing from 1,401 to 2,090. According to the 2010 census, the population of the Town of Polk was 3,937, with the Town occupying an area of 31.39 square miles remaining from its original territory. Within that area are 1,540 housing units, an increase of 316 units, or nearly twenty-six percent, from 1990. In the present day, the Town of Polk is virtually racially homogenous, with nearly 98% of the residents counted as white. As of 2006, nearly half of the land in the Town, amounting to 9,604 acres, was in use for agricultural purposes. The Town has convenient access to neighboring areas along several major transportation routes that connect it both east and west (via State Trunk Highway 60) and north and south (via State Highways 41 and 45). The Town of Polk offers 1,400 acres of public and private parks, including a portion of the Ice Age National Scenic Trail known as the Polk Kames. ^ Western Historical Company, History of Washington and Ozaukee Counties, Wisconsin (Chicago, IL: Western Historical Company, 1881), 424; “Town of Polk,” Google Maps, accessed December 8, 2015; Southeastern Wisconsin Regional Planning Commission, A Comprehensive Plan for the Town of Polk: 2035 (Waukesha, WI: Southeastern Wisconsin Regional Planning Commission, 2009), 54. ^ Carl Quickert, Washington County, Wisconsin: Past and Present (Chicago, IL: The S.J. Clarke Publishing Company, 1912), 33; Western Historical Company, History of Washington and Ozaukee Counties, Wisconsin (Chicago, IL: Western Historical Company, 1881), 718-719. ^ Western Historical Company, History of Washington and Ozaukee Counties, Wisconsin (Chicago, IL: Western Historical Company, 1881), 33. ^ Larry Gundrum and Dean Otte, “The Development of Slinger” in Slinger Advancement Association, Slinger Historical Album: Schleisingerville to Slinger, 125 years, 1869-1994 (Slinger, WI: Slinger Advancement Association, 1994), 34; Scott Simon, “Baruch Schleisinger Weil,” in Slinger Advancement Association, Slinger Historical Album: Schleisingerville to Slinger, 125 years, 1869-1994 (Slinger, WI: Slinger Advancement Association, 1994), 2. ^ U.S. Census Bureau, 2010 Census of Population and Housing, Population and Housing Unit Counts (Washington, D.C.: U.S. Government Printing Office, 2012), III-10. ^ Southeastern Wisconsin Regional Planning Commission, A Comprehensive Plan for the Town of Polk, 88, 136. ^ Slinger (Wisconsin) Centennial Committee, Schleisingerville to Slinger, 1869-1969: Historical Album and Centennial Program Book (Slinger, WI: Slinger Advancement Association Centennial Committee, 1969), 2-3; The La Crosse Railroad later became the Milwaukee & St. Paul. ^ Judy Steffes, “The County Annex II Used to Be ‘Asylum for the Chronic Insane,’” Washington County Insider, January 26, 2016, http://www.washingtoncountyinsider.com/2016/01/the-county-annex-ii-used-to-be-asylum-for-the-chronic-insane/, last accessed July 30, 2017. Western Historical Company, History of Washington and Ozaukee Counties, Wisconsin (Chicago, IL: Western Historical Company, 1881), 387. ^ U.S. Census Bureau, 2010 Census of Population and Housing, Population and Housing Unit Counts (Washington, D.C.: U.S. Government Printing Office, 2012), 40. ^ Southeastern Wisconsin Regional Planning Commission, A Comprehensive Plan for the Town of Polk, 24. ^ Southeastern Wisconsin Regional Planning Commission, A Comprehensive Plan for the Town of Polk, 45. ^ “Town of Polk,” Google Maps, accessed December 8, 2015. ^ Southeastern Wisconsin Regional Planning Commission, A Comprehensive Plan for the Town of Polk, 66. Slinger (Wisconsin) Centennial Committee. Schleisingerville to Slinger, 1869-1969: Historical Album and Centennial Program Book. Slinger, WI: Slinger Advancement Association Centennial Committee, 1969.